References in French fashion to the Revolution's victims are not exactly unknown - in fact, they've achieved an almost mythological status. 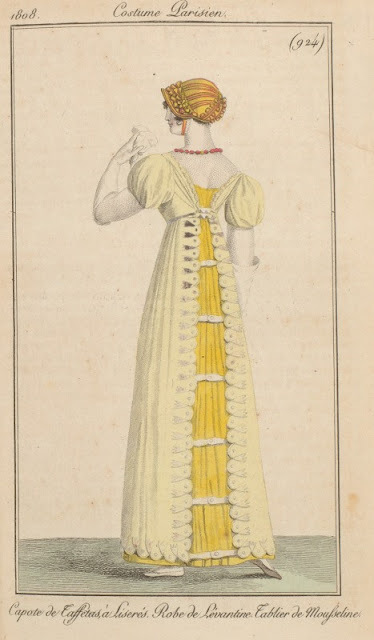 They seem to be thought of as a flash-in-the-pan pertaining only to the Directoire era (1795-1799) and its uncertainty, but in actuality, they lost the connection to the guillotine and continued to be worn once society had become more stable. The earliest appearance in a fashion plate that I'm aware of is the above, from Journal des Dames et des Modes in 1797. 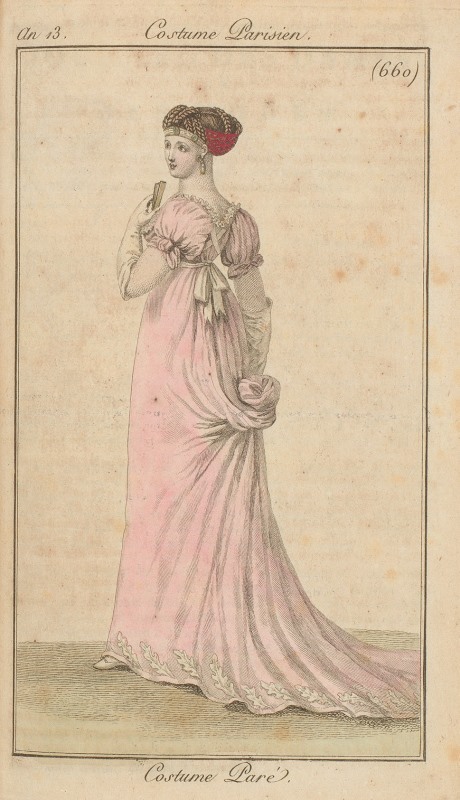 Variations, such as the "croisures à la victime" below (1797), appeared soon after. Both styles feature a bright, contrasting ribbon crossed over the back, wrapped around the shoulders, and tied at the waist. 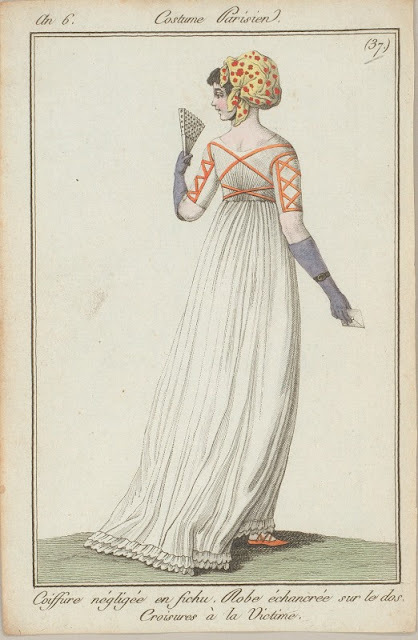 I don't find the references to the Terror's victims after 1797, but ribbon belts or sashes worn crossed over the back and around the waist continued to be depicted in fashion plates for about twenty years afterward. 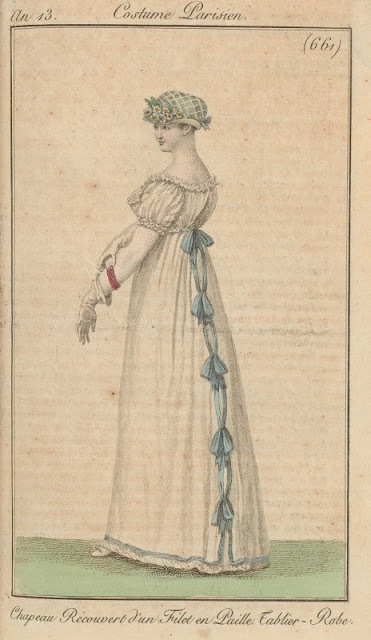 Ribbon color and pattern were very important to fashion during this period - one dress could last a wearer several years without appearing démodé, updated economically every so often with a few yards of ribbon. 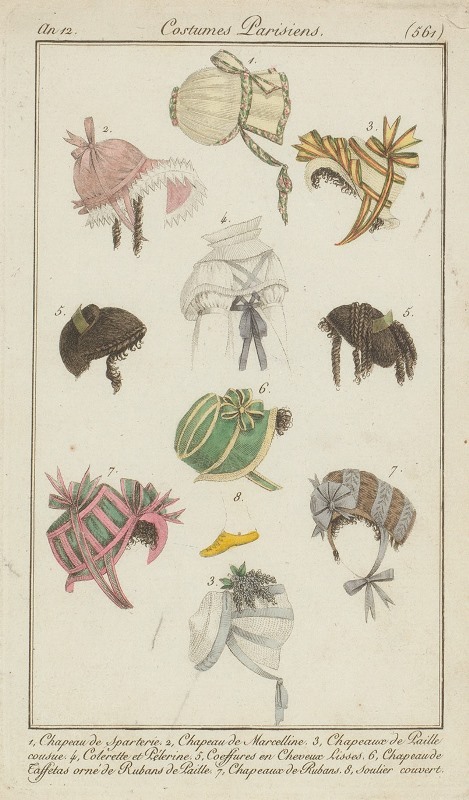 Fashions in trimming bonnets could also show the importance of fashionable ribbons on a plain background. Note that in this plate, the ceinture is so commonplace as to be included on a torso marked as displaying a colerette and pelerine. 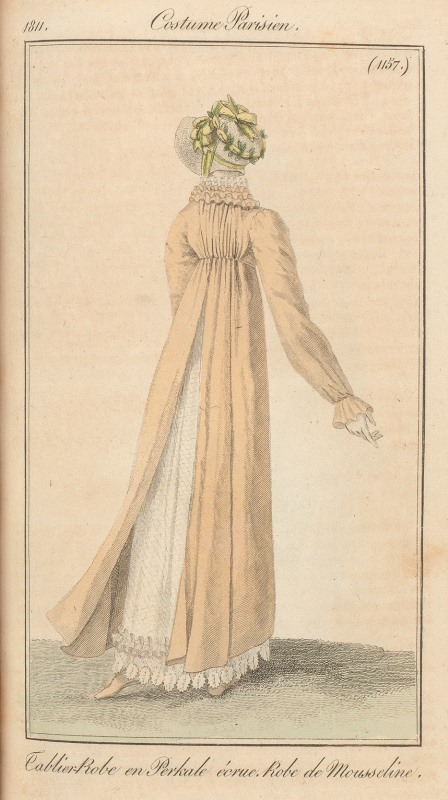 Unlike the ceinture à la victime, the tablier-robe (or robe-apron, although it does not turn up much in the English fashion press) seems to be completely unknown, but it also appears in a huge number of fashion plates. Always fastening in the back, it is sometimes shown with ribbons holding the skirts together or simply open down to the hem, sometimes buttoning in the bodice or tied at neckline and waist. It begins to appear in France around 1804, at the same time that gowns were transitioning to a back closure, and it continues to appear in fashion plates for more than a decade. There's little to say about the tablier-robe's evolution - ties all the way down tend to be earlier, but apart from that they tend to be a little fantastic and not follow a progression the way gowns do. 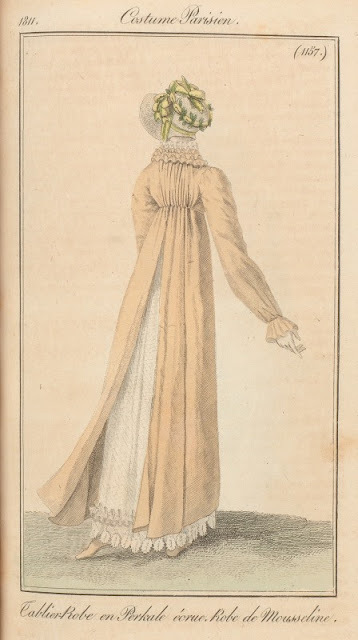 The only extant apron-robe that I'm aware of appears in Costume in Detail (p. 101): "white spotted muslin dress, very high waist, very low neckline." It has a tie at the back of the neck and four buttonholes (no buttons remaining), and the skirt is open the entire way down the back. This identification isn't definite, but it seems a lot more likely to me that it was intended to be worn over another gown than that it stood on its own. 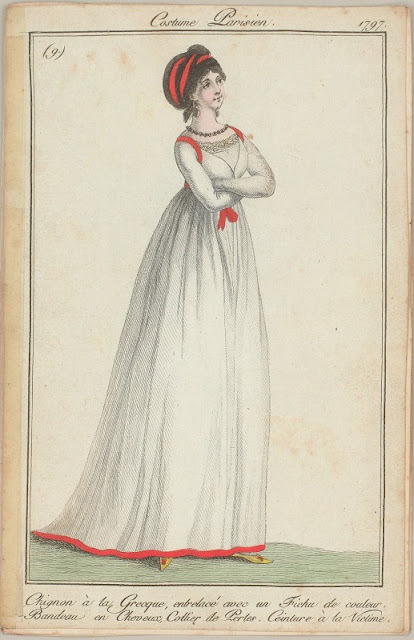 As I read about the apron-robe, I immediately thought of the Costume in Detail dress. It seemed curious and inexplicable until now. I think you're right that it is an example of one. I didn't think about it at all until the dress was brought up somewhere else, and then it hit me! I wonder how many there are in other collections that just don't have the full back opening noted in the description, or have it considered an alteration, or something like that. I definitely want to try it out on my Neoclassical dress sometime. Very striking in a bold color! I made a ball gown with the buttons down the back bodice and split. I did more research than I thought! What does An 13 have going on with her hair — looks like elaborate braiding with a hairnet sling? In my "I saw it somewhere" memory, there was a gown with a split back (with undone buttons/buttonholes) worn with a mid-century hoop. It is a very "antique" hairstyle - lots of braiding and a hairnet sling sounds about right to me! Interesting. You mean you saw it dressed that way in a museum/on a mannequin? Fascinating! I just discovered this blog, and now I have to check more posts. I'm learning about Regency fashion, and I'd seen the ribbons on some fashion magazine plates, but did not know the significance. The tablier-robe is new to me. Do I dare make one, or would the "experts" think I was doing something wrong? Back in the 80s, we used to joke about being able to look up and prove documentation on the spot. It's possible these days with tablets and smart phones. I've been to enough gatherings, though, where most people have their noses in their devises and I hope it doesn't happen at regency events.